My boyfriend and I wanted to come up with a cool couples costume that we could make ourselves. We brainstormed with a bunch of different Disney movie ideas and eventually decided on making a Homemade Mad Hatter and Cheshire Cat Costume. First of all, we went to a bunch of different thrift stores and searched around until we found the items we were looking for. For the Mad Hatter costume, we found the pants, sweater vest and the blazer. We bought the bowtie at a Halloween store, then spray painted it to make it the perfect shade of blue. The hat is from a Halloween store as well, but we added the gold ribbon around the bottom of it and stuck in the 10/6 card that we made out of white posterboard. For the hair, we actually used those fake cobwebs that you can buy at the dollar store. He wore a white dress shirt under the sweater vest and a pair of brown shoes to complete the costume. 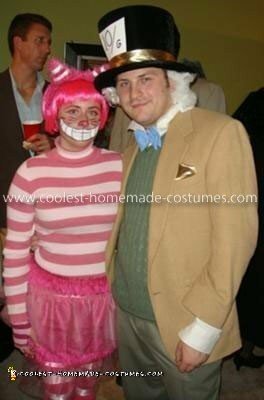 For the Cheshire Cat costume, we found that pink striped sweater at a thrift store. The striped hand covers I am wearing are a cut up children’s shirt we found at the thrift store that we cut thumb holes in. For the skirt, we went to a fabric store and found this fuzzy pink material that we then sewed into a skirt. We placed pink toole around the edge of the skirt and ran a pink ribbon through it so we could tie it. We found pink leggings from another store, and then we sewed lighter pink ribbons around the legs to make the leggings look like there were stripes on them. We found pink striped leg warmers that I wore over the leggings. For the shoes, we bought a fuzzy pink pair of slippers that we glued darker pieces of pink ribbon on so that they would be striped as well. For the tail, we covered a cat tail with the same pink fuzzy material and glued more ribbons on to that to make it striped as well. For the ears, we covered the cat ears with the pink material and then glued ribbon onto them to make stripes. I wore a pink wig and we used face paint to do the makeup. I also wore a pair of pink false eyelashes that really added a nice touch to the look of the face. We were really pleased with the way our costumes turned out and everyone else seemed to love them as well! It was really fun putting the costumes together and I look forward to coming up with another good idea for next Halloween!